French doors make a dynamic statement as an entranceway to your home, or out to your patio or back garden. They add a sense of style to both the exterior and interior of your home while opening up your living space with bright natural light from the sun. 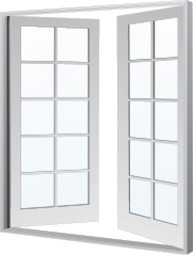 Any of the standard or decorative glass Meloche Windows & Doors carry can be used in a French Door system. Meloche Windows & Doors offers the best in paint and finishes for your windows and doors. Meloche provides a spectrum of colour possibilities with long-lasting beauty. The heat reflective technology present in all paints and finishes provides outstanding protection against all weather conditions without peeling, flaking or cracking. Come into our showroom to view our 22 standard colour selection and take home a sample today. Are you trying to match a specific colour in your home? No problem. Meloche Windows & Doors offers a custom colour matching program. Simply provide a colour sample you would like us to match and Meloche will do the rest. Interested in new or replacement casement windows for your home? Have a Meloche Window Expert provide you with the most accurate casement window pricing for your home. In order to provide the most accurate casement window cost and pricing information, we offer a free in-home consultation. Setup your appointment today. We’re always looking for skilled individuals to join our team.